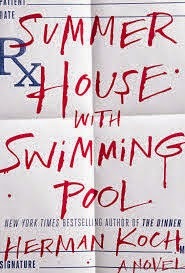 If you're looking for examples of what can go wrong on a summer vacation, look no further than Summer House with Swimming Pool by the Dutch author Herman Koch. Dr. Marc Schlosser is a general practitioner who is rather bored with his job and life in general. He's tired of the patients who come in and want to grumble for 20 minutes, or who insist on an exam or prescription when there's nothing actually wrong with them. He's beyond fed up with having to accept the social invitations to plays and other "artistic" events that feature his patients. It's at one of these events that he and his wife become friendly with the obnoxious actor Ralph Meier and his wife Judith. Ralph is larger than life and his boorish behavior makes it clear that he thinks he's entitled to whatever he wants -- food, women, the company of others -- no matter what anyone else thinks. It's therefore somewhat surprising (to his wife Caroline, at any rate) when Dr. Marc agrees to spend part of their summer vacation at the Meiers' summer rental house. Ralph's grotesque ogling of Caroline might make her skin crawl, but the two Meiers boys are close in age to Marc and Caroline's two daughters, so how can Marc disappoint them by refusing the offer? The fact that he's rather attracted to Judith Meier of course has nothing to do with his acceptance of the offer . . . While at the summer house, there are no end of unpleasant shenanigans taking place. The geriatric film director Stanley Forbes and his teenage girlfriend Emmanuelle are also staying with the Meiers, so there's plenty of people around for trouble-making. A night on the beach leads to all sorts of problems, including a major one involving one of Marc's family members that will have long-lasting consequences. Marc quickly decides on who the culprit was, and his later actions toward that person will impact nearly everyone in the story. I found the tone of the novel, especially at the beginning, extremely engaging. I really enjoyed the narrator's world-weary take on life. As the book went on and we got to know him better, however, I was less enchanted. I also didn't like the pronouncements that were made about men and women and the supposedly biological reasons for their behaviors that Marc was constantly putting forth. These "radical ideas" came courtesy of a professor he'd had in medical school. The ideas were so abhorrent that the professor was dismissed from his job in disgrace, although the ideas are now "generally accepted" as being true. The overall message was quite disturbing, and I ended up being rather disappointed in the book overall.